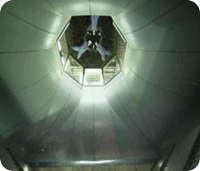 SkyVenture is a state-of-the-art skydiving wind tunnel designed for the general public. SkyVenture completely immerses visitors in the world of high adventure skydiving, without ever having to pack a parachute, pull a ripcord, or jump out of a perfectly good airplane. No experience is necessary. Virtually anyone can fly. Design and engineer a 1 mega-watt, vertical, recirculating wind tunnel. SkyVenture sells worldwide and the design had to meet local, state, federal and international standards. The design concept had to be modular so that it could be fabricated in the United States and economically shipped anywhere in the world for installation. Deaton Engineering also needed to interact with a diverse team of fabricators, control system and structural engineers, architects, aerodynamicists and owner groups. Deaton Engineering designed and engineered this mega machine entirely in SolidWorks. DEI provided program management and documentation services, and during construction managed component fabrication and part procurement. We created manufacturing drawings and sequenced assembly instructions to ensure that the machine could be assembled anywhere in the world. We were able to virtually load our modular assemblies into shipping containers. The budget and schedule did not allow for prototypes so finite element analysis (FEA) was implemented to optimize and validate the design. "Deaton Engineering has an experienced staff of mechanical, electrical and software engineers. We did not have the time to staff up and manage a large engineering group. We had to focus on growing our business." - Alan Metni, CEO of SkyVenture.